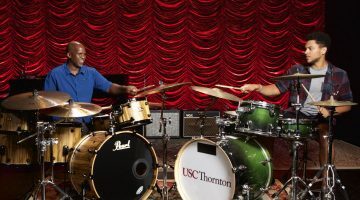 The USC Thornton Community Engagement Program is a diverse and extensive music education-oriented program that provides unique learning opportunities for children in the local community, as well as significant service-learning opportunities for Thornton students. Several music programs currently exist at the 15 local schools identified within USC’s Family of Schools. None of them, however, provide comprehensive music education, and only a handful of the approximately 17,000 students attend weekly school-based music classes. This realization prompted members of the community to request help from the Thornton School of Music. Each year, over 70 Thornton students and over 6,000 children in the community participate in the USC Thornton Community Engagement Program. Thornton majors in performance, composition, music industry, popular music and music education offer children a variety of learning and performing opportunities. Another facet of Thornton Community Engagement is JazzReach, a program that focuses on instrumental and vocal jazz teaching opportunities for Thornton Jazz Studies students. The Los Angeles Youth Jazz Ensemble, 32nd Street JazzReach Choir, Murchison Elementary JazzReach Choir, and Science Center JazzReach Choir are all branches of this unique program. For the latest news about the Thornton Community Engagement Program, visit our blog. 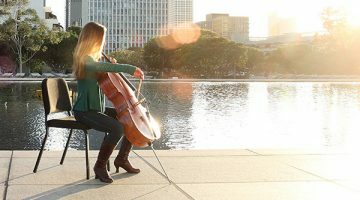 USC Thornton’s radical new approach to classical music education allows students to shape their own path by studying the things they love. 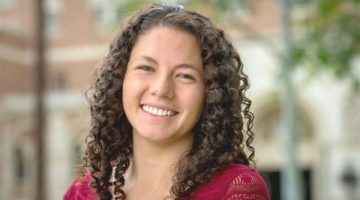 The 2018 valedictorian has helped spread the joy of music through USC Thornton’s Community Engagement Programs.